I have tried to capture a broad, but shallow dissection of ePortfolios based on my recent attendence at the second Australian ePortfolio Symposium (AeP2) hosted by the Queensland University of Technology (QUT) in February 2009, and a brief survey of literature. One of my observations is that there are many stakeholders involved in ePortfolios, and a tug-of-war exists over ownership and control. It seems to me that ePortfolios are trying to do too much. This blog post introduces briefly the concept of ePortfolios, including definitions and example products on the market. It then introduces the various stakeholders, and attributes goals/challenges to these groups in the use of ePortfolios. I explain my perspective on the tug-of-war situation, and how it may undermine the entire concept. The blog post concludes with a summary of my observations and my opinions on the future of ePortfolios. My organisation as far as I’m aware has done little if anything meaningful in the area of ePortfolios. Having only limited knowledge/understanding of ePortfolios prior to the Symposium, I did a little googling to find out more. For those who appreciate concrete examples, rather than abstract explanations, here is a list of common ePortfolio software to check out. Visiting their websites will give you a quick mainstream view of what ePortfolios are. From my readings of various articles on ePortfolios, I have come up with a composite definition that I feel encompasses the views of most of the experts in the field. Note specifically that Jackie’s definition states: “…encompasses the views of most of the experts in the field…” The concept and technology of ePortfolios is still very much in its infancy. People (especially formal educators) are still trying to decide what they want to do with an ePortfolio, and also working out what is possible with ePortfolios. This makes for a very erratic, chaotic time to attempt implementation of such a concept. A dream for the early adopter, a nightmare for the cautious. In fact, a colleague has highlighted an interesting and related point in his blog post Why am I a ePortfolio Skeptic? He draws attention to the ideas of Geoghegan (based on the work of Moore) where a chasm exists between the early adopters and the early majority. As you can see, one size does not fit all. This is an interesting challenge for those attempting to develop ePortfolio systems. How a learners may wish to use an ePortfolio can vary greatly. Another model that Wijnand illustrated during the presentation was that of the Balance Model. The goals of the learning are central, and supported by learning activities, which are then supported by the learning environment. This learning environment is supported by people, infrastructure, and management. Wijnand makes the explicit point that management support is crucial to the success of this model, but may be overlooked (or side-stepped). Wijnand introduced another interesting model illustrating the various stakeholders in ePortfolios as shown right. Keeping in mind, this is from a Dutch perspective. I have developed an adaptation of Wijnand’s model (below) which also includes the Government as a stakeholder. This is particularly true of the England where the English Government announced last year it was developing a national database to track student results from the age of 14. This was discussed at the Symposium, and there were many comments surrounding privacy, security and big brother. Without this extreme, I believe that government policy will play a part in ePortfolio usage in some way. In fact, the first two recommendations to come out of the Australian ePortfolio Project’s (AeP) final project report relate to Government involvement and policy creation. 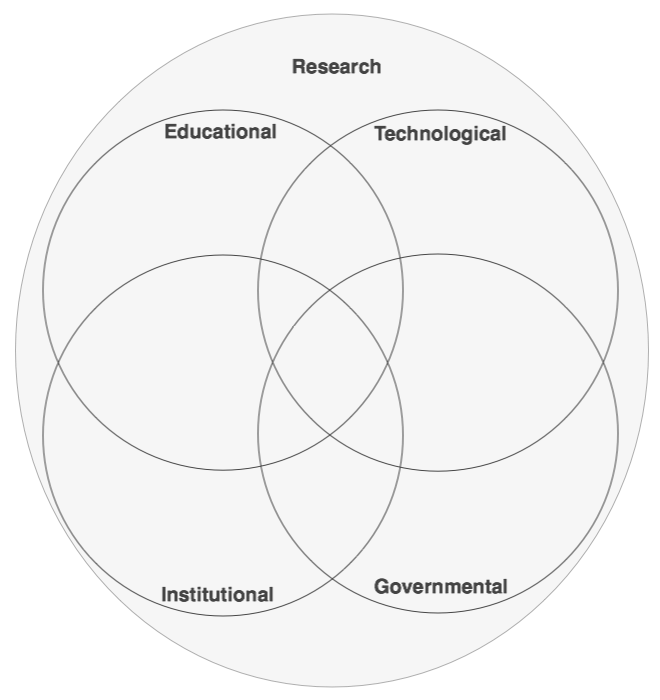 From my adapted diagram, you can see that governmental influence interelates with other stakeholders, and that research encompasses all aspects from all stakeholders. The ePortfolio concept has many stakeholders – those who have a vested interest in its development. Unfortunately, these stakeholders sometimes have competing goals. This has resulted in a tug-of-war situation. 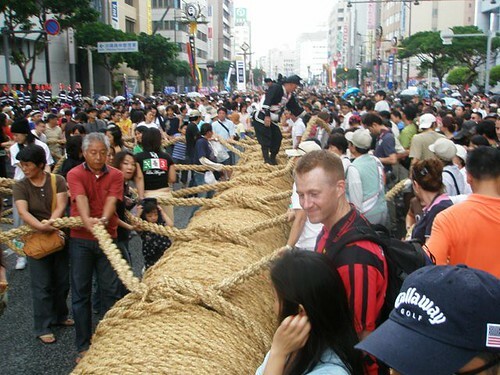 The ePortfolio (Okinawa) tug-of-war (http://flickr.com/photos/43277403@N00/1573849720/). So what does this mean? We have various groups competing with one another in influencing the design and implementation of ePortfolio to meet their own objectives. Somebody inevitably will lose out. I have composed a list of goals/issues/challenges around ePortfolios. It is not an exhaustive list, but the key points that I have discovered in my short ePortfolio journey. I have then mapped these goals/issues/challenges to the adapted stakeholder’s map to give a visual representation of the competing requirements of ePortfolios. The mapping is how I see these goals/challenges aligned with stakeholders. In particular, stakeholders with a primary interest of focus. While privacy and security is mandated by government legislation, I have not added it to the Governmental domain because it is not a primary focus of that group in this context. Of course, the mapping is from only my perspective. I don’t think there are any hard and fast rules here, just generalisations. Depending on discipline, some students require accreditation before they can practice. This is true of medicine, psychology, law and so on. ePortfolios could be one way that students can track their progress through their studies and check off the various benchmarks and attributes they require to meet accreditation. It may also allow the exchange of this information with accrediting bodies providing a more efficient and authentic accreditation process. By students documenting their lifelong learning achievements into an ePortfolio, it allows them to share their exploits with a world-wide audience. The opportunity to forge relationships with others in their field (engage in communities of practice), or to promote themselves to employers is very attractive to students. Of course, not all students are comfortable with exposing their achievements in this way. This comes back to privacy issues (discussed later). Using ePortfolios, there is an opportunity for teaching institutions to more easily collaborate on a range of activities. An example presented at the Symposium was the DEAMES (DEEWR EU Australia Mobilisation of Engineering Students) project (see 4.3.1.3 of the AeP Final Report). This project is headed up by the Queensland University of Technology and seeks to support mobility of students, graduates and academics in the discipline of Engineering. One of the problems is that there are disparate accreditation bodies for Engineering worldwide and currently they are incompatible. So the group wanted to develop double degrees in Engineering where students would complete a semester of their degree overseas in Germany which forms part of the European CLUSTER group of universities. Likewise, students from the CLUSTER group in Germany would complete a semester in Australia. The goal is to have the students accredited by both the Australian and European accreditation bodies. They hope to facilitate this collaboration through the use of ePortfolios. The mobility aspect would also apply to students moving between schooling, vocational educational training (VET), and higher education (HE), and so using ePortfolios would be one approach to better integrated relationships between these groups in support of lifelong learning (discussed below). As previously discussed, the English Government last year revealed new policy that would see the academic performance of students 14 years and over tracked in a central database by a unique learner number. It is recommended that the government departments with responsibilities for education engage with peak industry, professional and employer bodies to develop a shared understanding of the potential of ePortfolio practice to articulate employability skills. It is recommended that government policy recognise ePortfolio practice as a strategy to build an integrated relationship between higher education and the vocational education and schools sector, in order to support the individual’s lifelong and lifewide learning needs and to increase the potential for career progression. The whole idea of a standard is to reach agreement or consensus. Why is this so important for the data storage of ePortfolios? Students can invest a significant amount of time in the development of their ePortfolio. They want to be sure that it is transferable to other systems and environments to faciliate their lifelong learning. Refer to discussion on lifelong learning. This is one very good reason, but not the only one. There was a general disquiet surrounding the industry specifications supporting interoperability of ePortfolios. A delegate at the symposium made the following statement: “Standards take away from me – the way I work.” Another delegate asked the question (which I have paraphrased): aren’t specifications suppose to give me freedom, yet all they end up doing is constraining? Standards and interoperability in education is just plain hard. Education rarely fits into neat definitions, agreed best practices, or optimum solutions. Education is ultra contextual – its just plain messy. So how do you standardise messy? That was rhetorical – I don’t have any insight there. 🙂 There are so many stakeholders involved in ePortfolios, and there are so many definitions. Those who develop the standards will do so from their own perspective. Even if there is industry consultation, there is so much diversity that no one size fits all. A point highlighted by Wijnand in his triangle model of an ePortfolio. If you do not fit within the view of the standards developers, then you will feel constrained and disempowered. One of the leaders from the above list of standards is The IMS Global Learning Consortium and their ePortfolio specification. This is not the first time I have been exposed to the work of IMS Global. In the past, I have conducted research in the area of computer aided assessment (CAA) and developed addendums to their Question and Test Interoperability (QTI) Specification. That experience reminds of me of just how complex and detailed their specifications can be. The current state of play sees the IMS’ ePortfolio specification as one of the main players in the specifications stakes. Yet amongst the group, there was much disquiet about the effectiveness of this specification. It was described as over-detailed, complex, and difficult to implement. In fact, it was commented that there is a very limited number of products that adhere to the new specification. At the Symposium, there was discussion on the need for more generic/simple specifications rather than the specific/detailed/complex specifications that currently exist. The benefit of the more detailed complex standards is that they can make data more meaningful. The benefit of the generic/simple specifications is it provides more freedom for diversity and would be simplier to implement. An example of a generic/simple specification could be the use of the web 2 protocols, RSS and Atom (see Web 2.0 section). Of course, this freedom does not come without a cost. By designing and implementing a more generic/simple specification, you are limiting the scope of what is standardised and so interoperability can once again suffer. In my view, there needs to be a balance between these two end-points. This long standing battle in Information Technology also extends to ePortfolios. The same old arguments are bantered about from both camps. Open source solutions are free and not constrained by the whims of any one vendor. Commercial products have better support and are more enterprise level. Really, these blanket arguments cannot be applied across the board of commercial and open source solutions. Some open source solutions have excellent enterprise level support, while some commercial products have good TCO (Total Cost of Ownership) and listen carefully to the needs of their customers and respond to changes well. I spoke with a delegate at the Symposium who mentioned that his management exclusively use commercial products for their L&T. While my own institution initiated a review of our LMS and decided to shortlist only open-source products for selection based on software licencing costs. I find it somewhat frustrating to hear the rhetoric of the purists, who believe commercial or open-source is the best way for everything and ignore anything else. It’s very close-minded and short-sighted. Two common commercial products are Desire2Learn and PebblePAD. Two common open-source products are Mahara and Sakai OSP. There has been a growing interest in the use of Web 2/Social networking applications to support learning and teaching. There are many challenges to this approach, but there is great promise. In fact, I can see considerable overlap between the ePortfolios and Web 2 approaches. Yet, they appear to be in competition with one another. You either do it with ePortfolios, or with Web 2. One of the commercial ePortfolio products that I saw demonstrated at the Symposium discussed the idea of web 2 type interfaces to their system to be able to share syndicated data from your ePortfolio. This I thought was a good start. However, what about allowing data to come into your ePortfolio from other web 2 systems? I don’t believe this was supported by the product. To my way of thinking, it allows students/learners to use their own tools (something discussed in freedom/ownership vs. central control) to develop their ePortfolio, and then use web 2 tools to aggregate it into their ePortfolio and mash it up how they like. This also feeds into the generic/simple specification approach discussed under standards and interoperability). The opportunity of meshing web 2 and ePortfolios exist, but I believe it will be ignored as its not a priority of the top down group as discussed next. The questions are: who is driving the need for ePortfolios and who has the most pull? Top down suggests governments and institutional management. While bottom up suggests the learners and instructors. This epitomises the ePortfolio tug-of-war. These groups have different perspectives on what an ePortfolio should be, so there are competing goals at play. Those of the top down camp I believe are motivated by things such as streamlining administrative processes, improving institutional collaboration and gaining institutional competitive advantage. The value to this group seems to be in the way information about students can be shared with government, industry and other institutions that is more meaningful and I fear a marketing tool to demonstrate institutional competitive advantage (discussed below). While from the learners and teachers’ perspective, the value appears to be in things such as personal reflection on one’s journey and to gain perspective on where you are going (see career counselling below), and promoting your skills to an employer audience. I’m sure there are other aspects that I have not covered, but this was the trend that I saw emerge from discussions at the Symposium, and the promotional material from the ePortfolio vendors. For each group to maximise the effectiveness of the benefits they wish to draw from ePortfolios, the tug-of-war focuses around one particular aspect – control/ownership. Who should own an ePortfolio? Who should have primary control over it? The institition, or the learner? Whomever has the primary control will be able to most influence its design to maximise their goals. These views does not fit well with the overarching goals of the institutions. Yet, the products I saw at the symposium did not fit well with the comments made above. They were the typical large integrated computer system and designed to integrate with learning institution systems, such as LMSes. In my view, if the ePortfolio is optional, and students do not feel they have enough control or freedom to use it as they wish, they will probably not engage with it. If they are forced to engage with it through policy, they will either work around it as best they can, or they will just go elsewhere. Wijnand made the following point: we must seek balance between “free creative learning of motivated students” and “organisations capturing and controlling of student progress.” I’m not sure trying to strike a balance here will generate a happy result for anyone. One of the salesmen for an ePortfolio product made the comment that there can be a competitive advantage to adopting their ePortfolio system and making is available for free to students who join the institution’s alumni. The rationale is that it will maintain a link with the student after they have graduated in the hope that they will return to the institution when they decide to further their study. It was also commented that having an ePortfolio system for students is a marketing tool to discern one institution from another. Obviously this is very short-sighted as eventually all will have them in some shape or form. This is all assuming that ePortfolios are what students want of course. This is where I can see great value in an ePortfolio from an educational perspective. Documenting your exploits as a students and plotting your progress is a great way to reflect on your journey. It would be very useful for students to be able to work out where they want to go with the life. Of course, there are other ways to do this besides an ePortfolio. The weblog would be a classic example. Some of the ePortfolio systems that I saw had integrated assessment systems where students could write a paper for example in their ePortfolio, and then links in the system would allow their teacher to assess it and store a grade. I think this is another example of an ePortfolio system trying to do to much. This was a big topic of conversation during the Symposium. Given the nature of information being recorded in an ePortfolio, there is a clear justification for ensuring privacy/security. However, whose responsibility is it? I guess it depends on who wins out in the freedom/ownership tug-of-war. Privacy laws vary from country to country. In Australia, the laws are reasonably firm in terms of maintaining privacy. This is also true of the education sector. In a time when online social networking is becoming a popular tool for learning, this presents some interesting challenges for educators in ensuring that student confidentiality is not compromised through these activities. ePortfolios would certainly fall under this banner. How much information a learner is prepared to make public about themselves is a very personal choice. In fact, this is one challenge learners (and teachers) will face if attempting to use social networking software such as blogs. It is especially true in an age where identity theft is as violating as someone breaking into your home. The difference with identity theft is that the theft can continue over long periods of time as the thief uses your identity to steal from others, and in the process ruining your reputation. It is vital that ePortfolios provide the appropriate security controls so that learners can set privacy levels that they are comfortable with. Otherwise, there will simply not engage. Lifelong learning – the concept that learning occurs both formally and informally throughout one’s life, and is not limited to formal classroom or occupational settings. There is also the aspect of learning skills to make you a lifelong learner – someone who can adapt to a changing world and be self-sufficient. So I guess the point here is that ePortfolios can facilitate the learner’s journey throughout their life as they build a portfolio of life experiences, both formal and informal. So it is important that their ePortfolio is able to grow and evolve over their lifelong journey. This means it must be portable (refer to interoperability standards). Interestingly, a parallel or overlap can be identified between the concepts of lifelong learning, ePortfolios, and Personal Learning Environments (PLE). Thoughts I’ll try to capture in a separate blog post. From my education perspective, I think the greatest value of an ePortfolio is the ability of learners to reflect on their achievements. It can assist with planning their future endeavours or to promote themselves to employers for example. However, the tug-of-war between institutional and educational goals threatens to undermine the entire concept and make it unworkable for everyone. What does it mean for those who lose the tug-of-war? If ePortfolios are hijacked by institutional needs, in my view it is unlikely that students will see value in engaging with them. If they are not taken up by students, then it will clearly fail. If the educational goals take precedence over institutional goals, then the concept may not reach its full potential. I really wonder whether there is a happy middle ground between the needs of these two groups. I wonder whether it is necessary to have one single monolithic system to support all functions desired by stakeholders of ePortfolios. Why not support the educational goals through web 2 type technologies, which hand control and ownership to the learners, but can interface through simple standards such as RSS and Atom with administrative systems maintained by institutions? This would mean a convergance perhaps of ePortfolios and Personal Learning Environments for learners, with links to institutional systems supporting other aspects of ePortfolios such as accreditation and institutional collaboration. Want to prove to an employer that you have credentials, direct them to an institutional system that validates your qualifications. Do this via your own PLE/ePortfolio using web 2 technologies. Interesting post! Regarding standards an interoperability, I can echo the sentiments you heard about the IMS ePortfolio standard. Mahara had been hunting around for a standard to implement since the project began, but IMS was always considered too abstract and complicated to touch. Penny Leach, a fellow core developer on Mahara, humourously tells the story of how once she was looking at some IMS standard, and apparently their example documents didn’t even validate against their own XSDs – which for the lay person means they were basically saying “don’t play on the grass” while setting up a football pitch. We’ve been involved in the LEAP2A work, along with PebblePad and several other (mainly UK based) ePortfolio vendors. It’s been a successful project – there’s now several portfolio systems that are only a few bug fixes away from some decent interoperability. If only someone would tell IMS that you can’t develop a standard until you have vendors on board – in fact I’d go one forther to say you can’t develop a standard _unless_ you have them! HTML wasn’t invented in some dark room by the W3C – it was implemented by a few vendors first.